The heart consists of 4 chambers in mammals. The upper two chambers are atria, and the lower ones are ventricles. Ventricles work as pump to eject blood to whole body. Atria have 2 important roles: 1) to assist ventricular pump function, and 2) to generate and conduct the excitation signal to regulate heart rate. Atrial fibrillation (AF) is one of the most common arrhythmias across the world. In the elderly, almost a tenth part of the population is suffering from AF. In an AF patient’s heart, the atria beat rapidly and irregularly at rates of 400 – 600 beats per minute (bpm, Fig. 1). The heart rate varies by conduction between atrium and ventricle. It is well-known that AF increases the risk of mortality, embolic stroke, and heart failure, resulting in impairing our healthy life (Fig. 1a). The pathological mechanism leading to AF has 2 factors: an electrical disorder by change in ion channel expression, and a structural disorder mainly due to fibrosis. Fig. 1. a: Atrial fibrillation (AF) causes critical complications, such as stroke and heart failure. b: Atrial arrhythmia was easily induced in the HFD mouse by arrhythmia induction test. 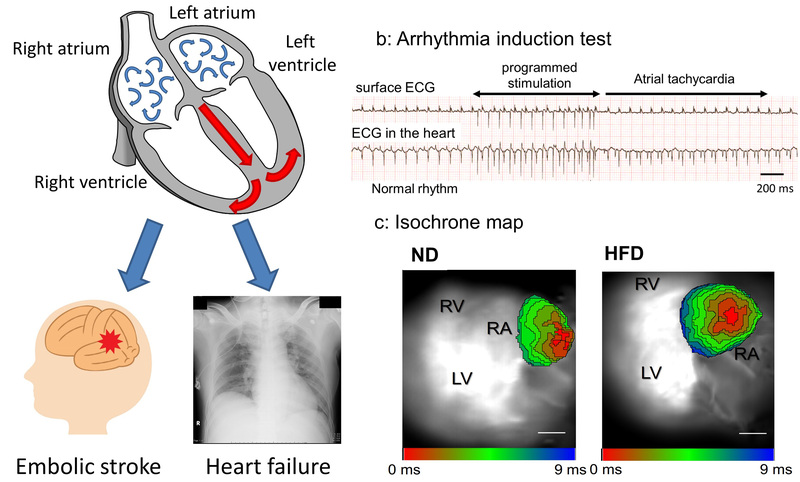 c: Isochrone map recorded by optical mapping showed slower conduction velocity in the HFD mouse atrium. To date, several risk factors have been identified relating AF. It has been reported that lifestyle-related diseases, such as obesity, hypertension, and diabetes mellitus are important risk factors for AF. However, little is known about the underlying mechanism linking these diseases and AF. We conducted the experiments to investigate the mechanism. Especially we focused on the obesity. To make an obese animal model, adult male mice were fed a high-fat diet (HFD) or normal diet (ND) for 2 months. Electrocardiography (ECG) and the arrhythmia induction test (by stimulating an atrium through small catheters in the heart) were performed under anesthesia. Gene and protein expressions in atria were also analysed. Then, we excised mouse heart, and performed an optical mapping using isolated heart. The optical mapping system is able to detect the electrical activity by using the voltage sensitive dye, and to measure the electrical conduction velocity (CV) in the atrium. ECG recorded in HFD mice showed prolonged P wave duration, which indicated the reduced electrical conduction in atrium. In the arrhythmia induction test, sustained atrial tachycardia was more frequently observed in HFD mice than ND mice (Fig. 1b). Optical mapping revealed that HFD mice had reduced atrial CV compared to ND mice (Fig 1c). However, fibrosis in atria was not prominent in HFD mice. These findings suggested that electrical disorder in the heart was the dominant cause rather than cardiac structural change. Fig. 2. Graphical summary of this article. Protein expression analysis demonstrated that one of the gap junction channels, connexin40 (Cx40) was decreased in HFD atrium. Gap junction channels connect two adjacent cells, and when one cell was stimulated, the electrical activity was conducted to next cell. If the expression of gap junction channels decrease by some reasons, electrical impulses are conducted slowly (Fig. 2). Therefore, reduced expression of Cx40 resulted in slower CV, and the subsequent electrical disorder resulting in AF. Next, we focused on ‘microRNA’ to regulate the expression of Cx40. MicroRNA is a very small ribonucleic acid (RNA), which contains about 22 nucleotides. MicroRNA interacts with messenger RNA (mRNA), and regulates the gene expression by degrading mRNA of specific genes, and inhibiting the production of protein (Fig. 2). 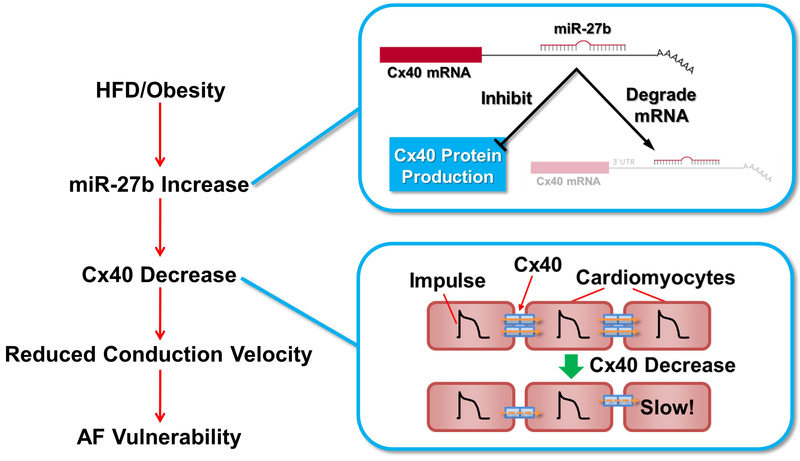 We performed comprehensive analysis to measure the expression levels of approximately 700 microRNAs (miR), and found miR-27b, microRNA related with obesity or adipose tissue differentiation, was increased in HFD mice. Moreover, the direct interaction between Cx40 and miR-27b was confirmed by the cell assay. In conclusion, we demonstrated that HFD increased the vulnerability to atrial arrhythmia by electrical disorder in the heart resulted from decrease in Cx40 expression via miR-27b, rather than cardiac structural change (Fig. 2). Our findings will help uncover the global perspective of AF pathophysiology, and develop a novel therapeutic target of AF. High-fat diet increases vulnerability to atrial arrhythmia by conduction disturbance via miR-27b. Takahashi K, Sasano T, Sugiyama K, Kurokawa J, Tamura N, Soejima Y, Sawabe M, Isobe M, Furukawa T.